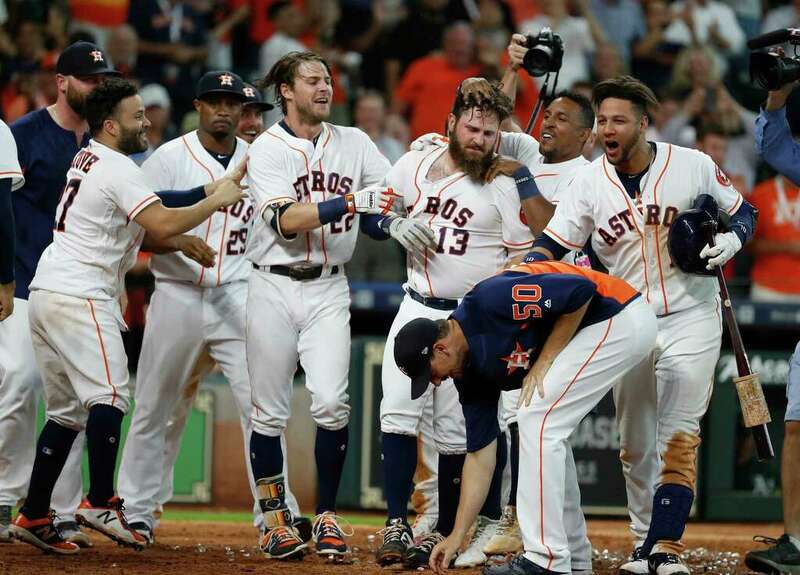 In a game that featured 14 bases on balls, a wild pitch, a passed ball, an error and a hit batsman, Tyler White struck the final blow on Wednesday with a walk-off pop fly that nestled into the Crawfords and gave the Astros a 5-4 triumph that pushed their lead over Oakland to 2-1/2 games. Barring an unforseen playoff event, the two clubs have met for the last time this year and September has yet to arrive. Apparently, the way to get to Trevor Cahill is to get him away from Oakland. The home/road splits on this guy are rather extreme. In his team's biggest game of the year, Cahill lasted just 3-1/3rd innings while allowing four runs on five hits and six walks. But Dallas Keuchel wasn't his sharpest either. He at least held on for six innings and only walked one but allowed eight hits and three runs. Brad Peacock ruined his day by loading the bases then plunking Stephen Piscotty to allow the tying run to skip home. While 32,926 attended the businessman's special, Houston opened up a 2-0 lead in the first on Jose Altuve's RBI single and Carlos Correa's sacrifice fly. Oakland answered with three in the third, keyed by Jed Lowrie's RBI single to left and Piscotty's double that plated two. The see-saw swung back Houston's way in the fourth when the Astros loaded the bases and George Springer snapped an RBI single. Alex Bregman followed with a bases-loaded walk to reclaim the lead, 4-3. Piscotty's hit-by-pitch tied it in the seventh and it stayed that way until the bottom of the ninth despite the chances both teams had to add more runs. The Astros were 2-of-7 with runners in scoring position and stranded eleven. Oakland, meanwhile, was 2-for-13 with ducks on the pond and they left 10 on base. Finally, White ended the madness in the bottom of the ninth. He got around on a 90-mph 0-2 slider from Jeurys Familia that flew high over left field and plopped into about the sixth row of the Crawfords to end the game. Roberto Osuna picked up the win in relief. The Astros bid adieu to Oakland and say "Howdy!" to the Angels of Los Angeles at Anaheim who come to town for a four-game weekend series. Houston just swept the Angels last weekend in Anaheim and the Angels have announced that they've lost Albert Pujols, the all-time opponent home run champion in Astros history, for the rest of the season. We at Astros Daily are "deeply saddened" by this development. The Thursday night opener features Justin Verlander (13-8) in a rematch with Roger Heaney (7-8). The first pitch will be at 7:10 pm Central time. The Astros also announced that starting pitcher Charlie Morton will be on the disabled list the next ten days while he works out discomfort in his right shoulder. The prognosis is that he will only miss one start. To take his roster spot, the Astros recalled reliever Chris Devenski from the disabled list. Word is also circulating that Manager A.J. Hinch will be receiving a contract extension shortly.